Another day, another organized drawer. Yesterday's home office drawer was just what I needed to boost the functionality of today's drawer. 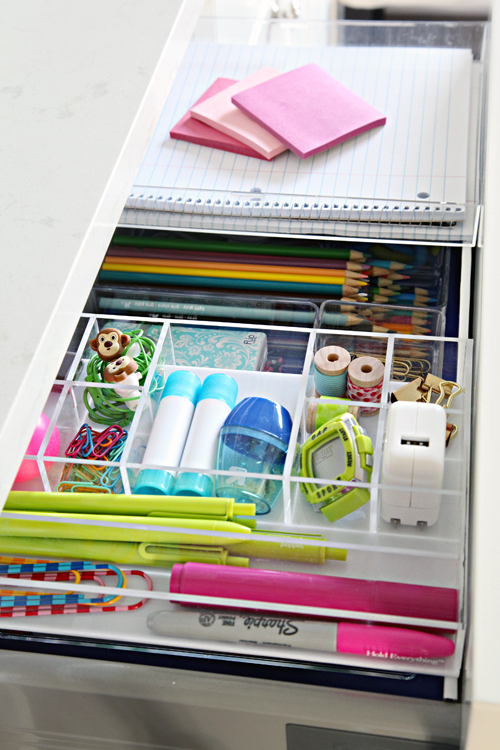 With the boys starting school this week, we were in need of an organized school supply drawer to give them all of the necessary homework tools for a successful year. In the past we have purchased each boy individual sets of supplies and stored them within their own personal study boxes. Although the boxes work fairly well for a good part of the year, eventually supplies start missing, the boxes are left all over our home and cars and the contents become so jostled that they are no longer helpful to the boys. Now that we have a set of drawers near our dining room table (where our younger boys do their homework), I wanted to dedicate one of the drawers to their studies. 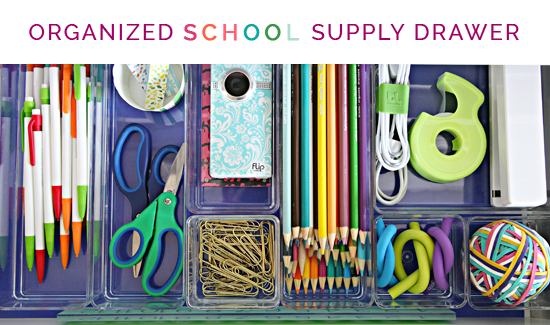 This way I only had to purchase a single set of supplies and could expand the contents of the drawer to the types of items we found we needed during previous school years. So as part of the Four Days & Four Drawers challenge, I knew it was perfect timing to get this drawer in top working order. 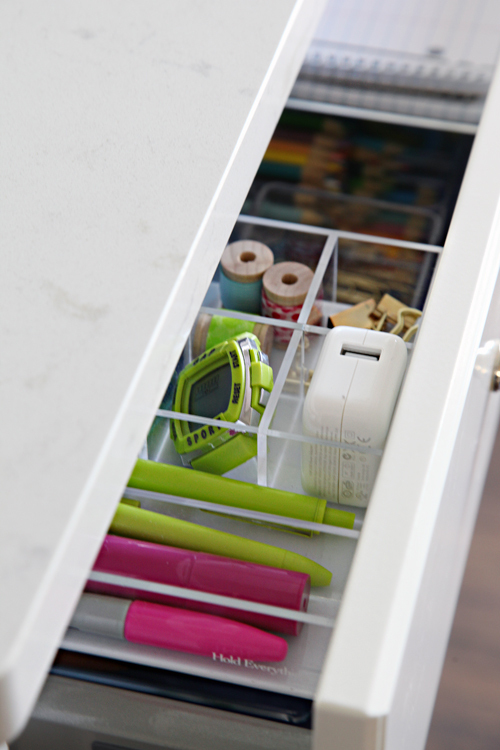 Because this drawer is new-to-us, there are no messy before pictures today. Just a blank slate. The first step was to gather all of the supplies and dedicate organizers to fit those supplies. 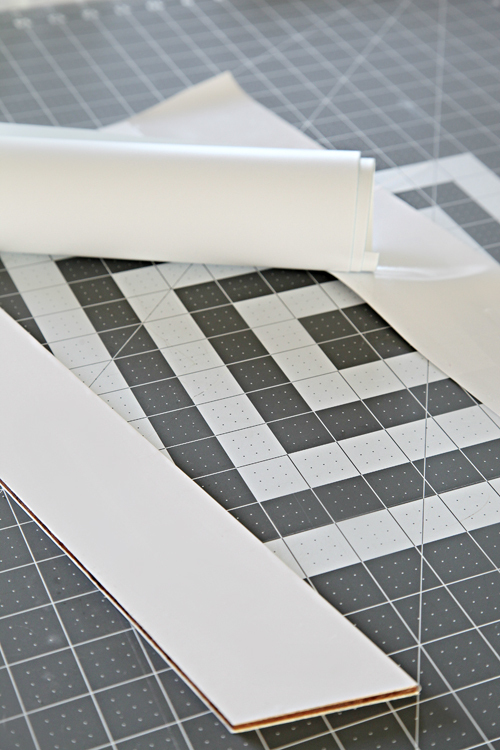 I went with my go-to dividers because they come in a variety of sizes to customize our layout (and once again, I love the durability, versatility and cleanliness they provide). Here is another fun animation to show the evolution of the main portion of the drawer (I think I am officially in love with .gif making). 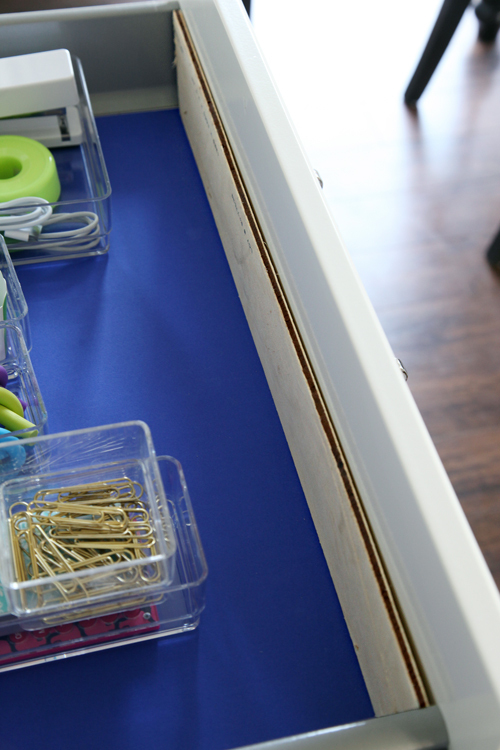 This time around I just lined the drawer with some blue cardstock to anchor the acrylic and colorful supplies. After the initial set of organizers went in, I started getting happy goosebumps. However, as I started planning this project, I realized that I had more supplies than I had room for in my drawer. I also realized that the amount of organizers and dividers I had were not all going to fit. These drawers are not as deep as what I am typically use to, measuring in at 9 1/2" deep x 20 1/2" wide. I had room for one set of dividers, but still had two more trays to factor in. But that is why yesterday's project was a good place to begin, because the concept allowed for me to re-think how to make the most of today's drawer. What worked so well for me yesterday, was the ability to add a second layer of organization that still allowed me to easily access the first layer. The specific organizer I utilized with my filing cabinet drawer was not going to work for this setup, but that didn't mean I couldn't try to replicate the concept. One "tray" was intended to hold loose leaf paper, a blank notebook and a few stacks of memo pads for extra note taking and scribbles. The tray was actually just part of an inexpensive acrylic box picture frame. The other tray was an organizer I picked up awhile back at HomeGoods and was nicely divided into smaller sections for those smaller items. See how those two trays are now have enough clearance to place items below? The process was much more simple than I initially had planned. I am so excited about this! Step one was to measure the width of the drawer and determine the height for the new trays to easily glide (and offer clearance for the items below). 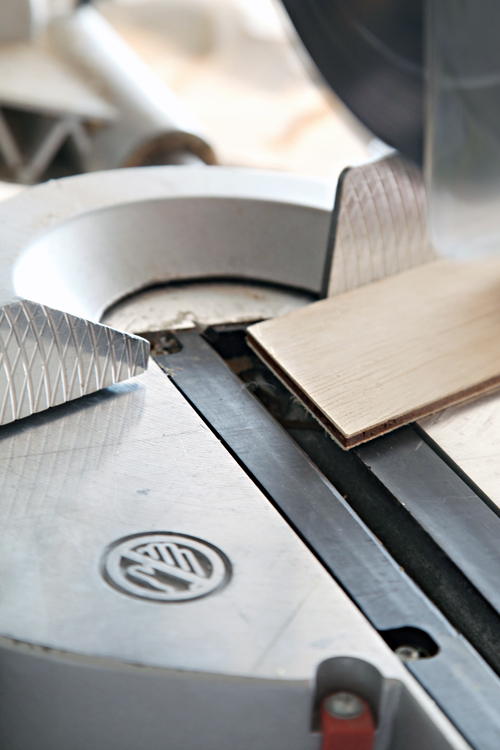 Once we had our measurements, we found a piece of scrap wood to cut to size. Because our IKEA drawers have an odd angle where the bottom joins the walls, we cut the ledge at a 45 degree angle. 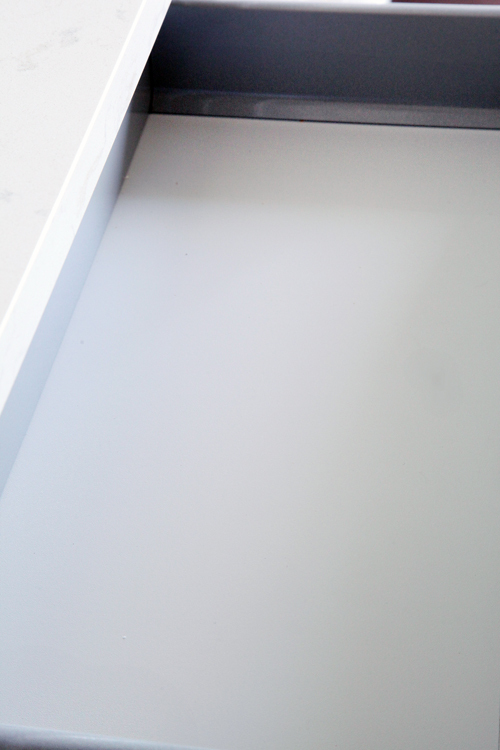 Wanting a nice finished appearance that would just blend in with the face of the drawer, I grabbed some white vinyl (typically used with my die cutting machine). I could have also used paint, but didn't want to risk a sticky finish. 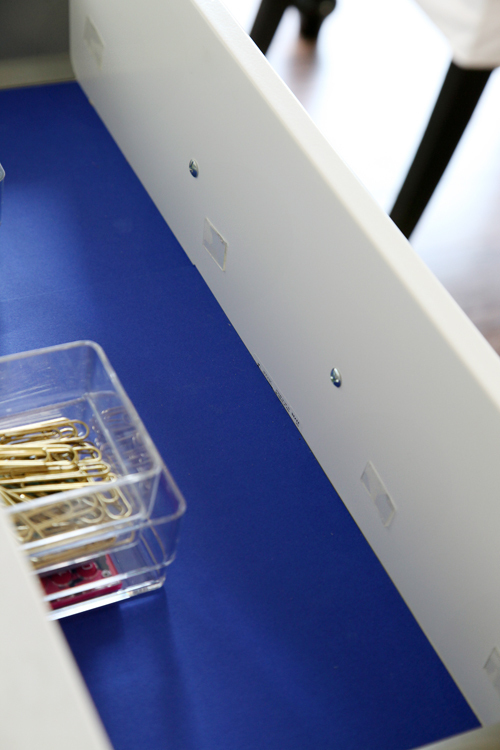 I then found some adhesive mounting strips that I cut and stuck to the front of the drawer. Ten minutes later I had an edge for my organizers to sit and slide on. The back of the trays rested nicely on the back side of the drawer (but we easily could have mimicked this idea on the back side if necessary). To prevent them from falling behind the drawer, I added some sticky feet to the bottoms. And now we have double the school supply storage area in a single drawer. Here is a side angle to show the drawer closing without any height issues or hangups. Everything is easy to find and I love that the organizers can swiftly move to the table and be put right back. I have a feeling this is going to become the most utilized drawer in our home. One day in and it has already been a definite hot spot for our boys. Don't forget that you can join in on the challenge with me! Small organizing projects are contagious and motivating and I am still on fire to tackle two more drawers. I hope some of you are excited to take on a drawer or two as well. 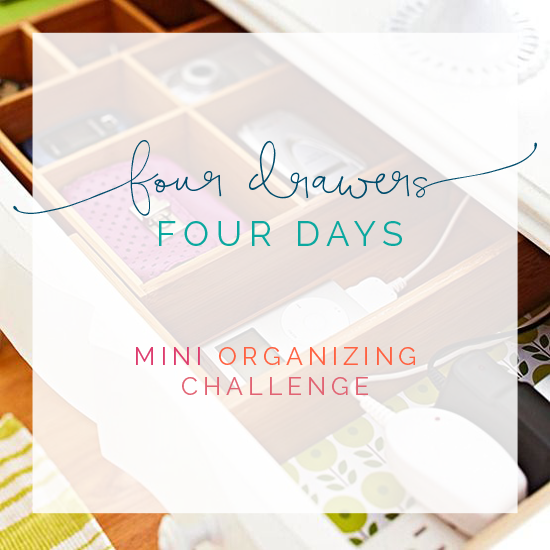 Friday will be "link up" day and you can also share your photos with me anytime via Instagram with the #4drawers4days hashtag. I absolutely love love love the layering idea!!! It's such a great way to conserve space - thank you! The drawer looks great! I ordered some of the acrylic organizers you used yesterday and today and I should get them tomorrow. I can't wait to start using them. Thanks for the inspiration. WOW! 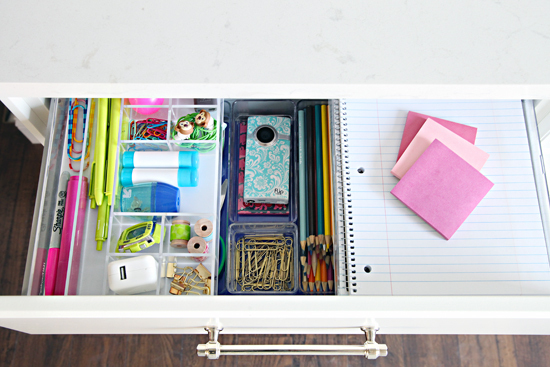 Beautiful organized drawers, the idea of making a layer on top is simply genius. Your boys are extremely lucky that they have a mom like you! Loved the animation too. 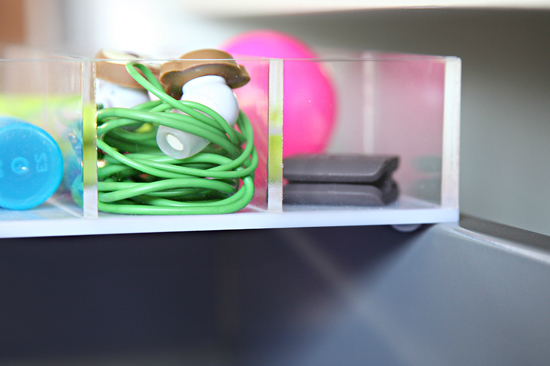 I am going to order those clear dividers from amazon for my drawers, thank you Jen for inspiring us. I really love how colorful it is. 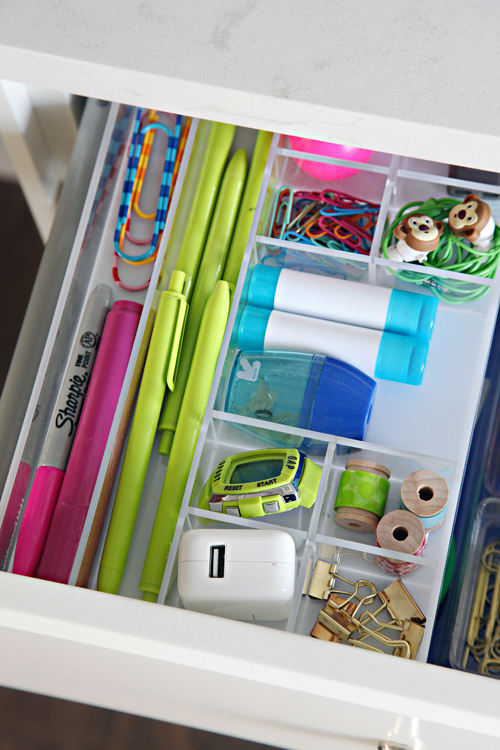 Now I have this urge of organizing our drawers as well. Hey Jen! This looks amazing... one (probaby very silly) question... I saw your "pretzel" looking thing in your drawer yesterday and the boys have 3 in their drawer, as well. What are those??? What is a butterfly clip? Love the layering idea. Everything looks so fresh and clean. So smart! 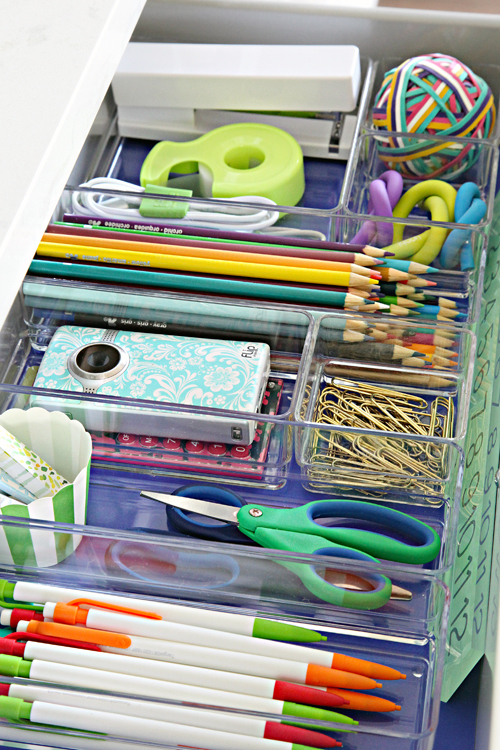 I love looking at pictures of colorful and organized drawers. Love the gifs, but can you slow them down - a lot? 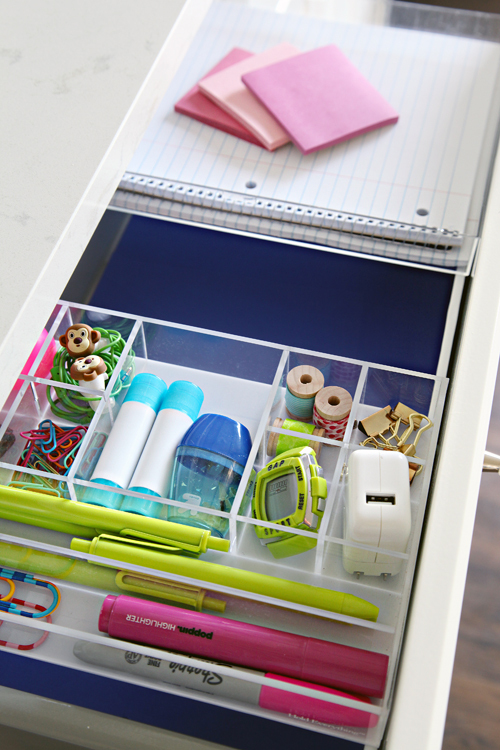 I just love the way you always think outside the box (or drawer!) I want a drawer like this! So love the idea! thanks for sharing! I love the way you think and make your ideas come true! That layering possibility rocks! I can`t wait to have a drawer where I could put that idea in action! I do like your colorful drawers, but love the fact that this could be done with any color palette, even in black and white :). 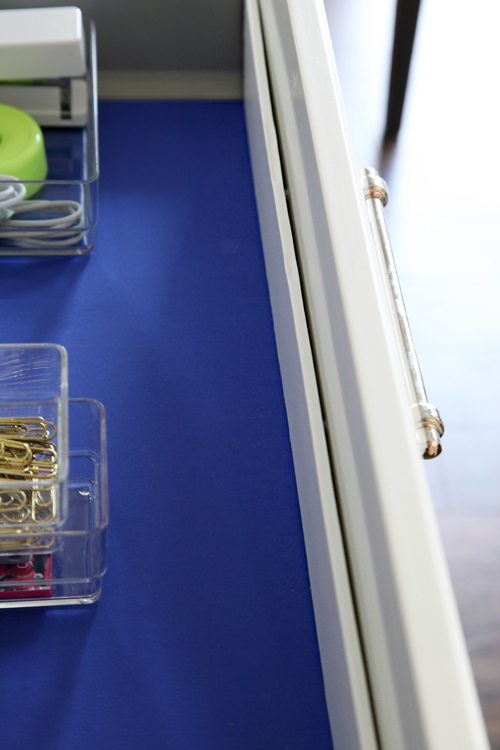 I wish we would have such a great selection of acrylic organizes here in Finland! I also envy all those lovely vinyls, gift wraps and drawer liners. That layering idea is brilliant, Jen! We have the same cabinets in our mudroom now and I think this will work perfect! Hey Jen! 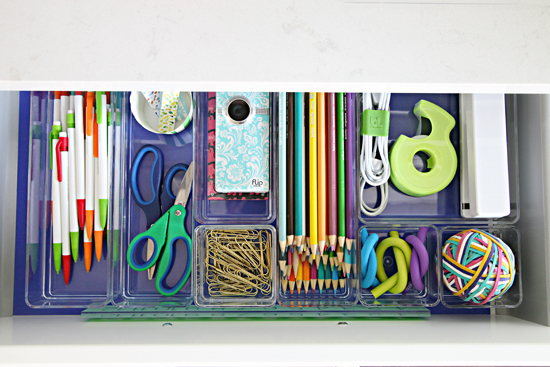 I love this idea so much that I just ordered these organizers! I'm an acrylic girl too! 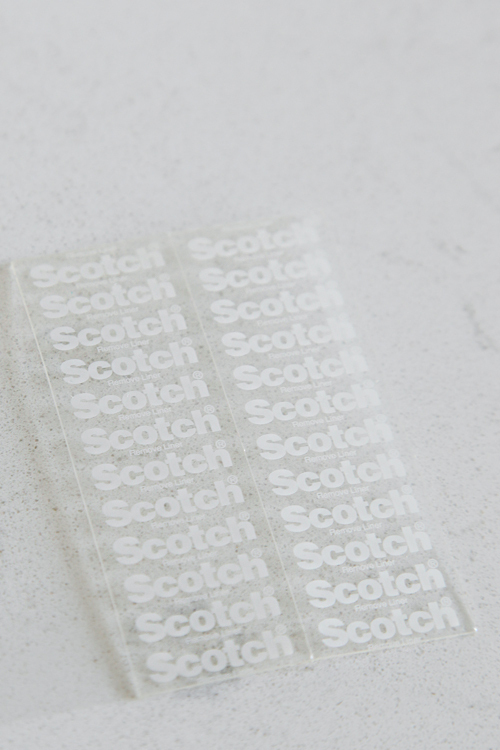 Do you mind sharing where your custom stamp is from? 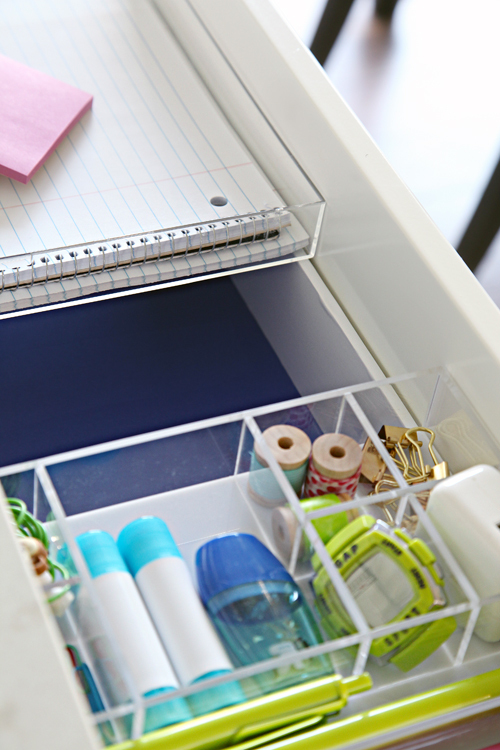 That drawer looks great and such a quick makeover that makes a world of difference. I love those kinds, and I really like those sliding clear trays! You can optimize so much space and it still looks great. P.s those .gif photos are so fun, I like those and it's fun to see something different.